Newly renovated penthouse in a lovely New York loft style. This well-planned home over 57 m² consists of two bedrooms, a bathroom and a kitchen- and living area in open plan. The large panorama windows give a great view over the mountains, the city of Palma and bring light into the whole apartment. The large terrace of 20 m² is perfect for morning coffee or a lovely big dinner with loved ones. Here you can enjoy lots of hours of sunlight and magical sunsets. 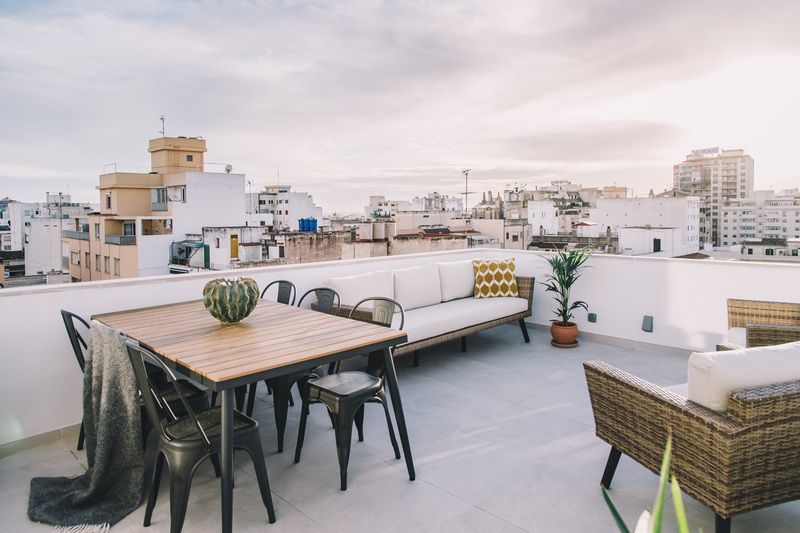 The apartment is located a stone's throw from Calle Blanquerna with its wide range of restaurants and bars. A super nice penthouse that we really recommend. Features: underfloor heating, building with elevator, beautiful stone flooring and brand new kitchen with the quality countertop.